Today's card features the stamp set from the Simon Says Stamp's September card kit. I started this card by stamping a bunch of the images from the stamp set repeatedly on a piece of Canson watercolor using Versmark ink. I heat embossed those images using a gold embossing powder. Next I colored in the images using my Arteza Real Brush Pens. I tried to keep the colors very light for a more pastel looking result. Next I stamped one of the mermaids on a piece of Bristol Smooth paper with Simon Says Stamp intense black ink. I colored her in using the Arteza markers as well. I fussy cut the mermaid out with my scissors. Check out the video for all of the coloring details! I created a card base out of Canson watercolor paper because that was the only paper I had large enough for this card. The card base is 6x6. Next I adhered the patterned background I created onto some gold card stock and then glued that to the card base. I cut a square piece of vellum and stamped my sentiment on that with Versamark ink. I heat embossed the sentiment in gold, making sure to let my heat tool get nice and hot before using it on the vellum. I made a square frame out of some more Canson watercolor paper and glued that to the piece of vellum to make my shaker window. I made sure the vellum square was slightly larger than the frame so that there would be a small vellum border. I added a bunch of blue (and a few white) sequins to the middle of my card and then placed the frame over them using foam tape. I really like the way the blue sequins look inside the vellum shaker, it makes it look like the water. Next I glued down the mermaid that I colored in to the shaker window with Tombow glue. For the finishing touches I used a white gel pen to add details and highlights to the mermaid. I added some glitter to her with my Wink of Stella glitter brush. I also used a gold paint pen to add a dash line boarder on the inner portion of the shaker frame. Finally I added a few white sequins with some Tombow glue. 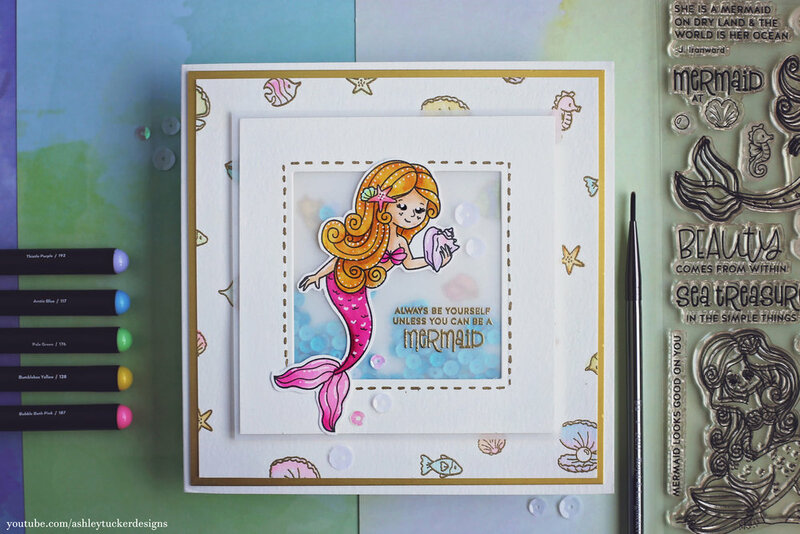 Today I am using the Beautiful Mermaids stamp set from the Simon Says Stamp September card kit again. I started with a piece of Canson watercolor paper taped down to a board. I used my Gansai Tambi watercolors to paint a really simple background using color numbers 37, 139, and 66. Once I had the background painted and it had dried completely I started doing an interesting texture technique. I added a bunch of dots of Glossy Accents to the panel and then went over them with a flat paintbrush. I made sure to not spread out the Glossy Accents completely flat and instead left streaks of texture. It is a really fun way to add a subtle and interesting detail. Next I stamped one of the mermaids onto a piece of Bristol Smooth paper with Simon Says Stamp intense black ink. I colored in the mermaid using my Arteza Real Brush Pens. 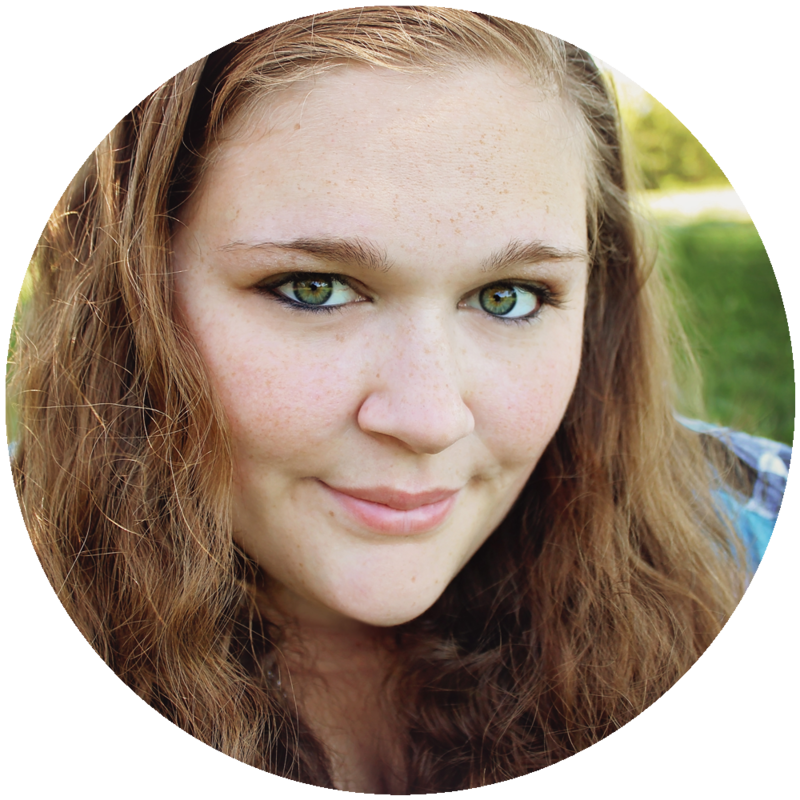 For the skin I used the color Pale Skin. For the hair I used the colors Pale Green, Shamrock Green, and Turtle Green, On the tail I used the same colors that I used for the hair along with some Acid Yellow. Finally for the bikini, the star, and the headband I used Acid Yellow and Honey. I then fussy cut the mermaid out with scissors. I popped up my watercolor background onto a card base and then added dashed lines to the edge with a white gel pen. I also popped up my mermaid so she is facing the light source in the background. I picked out a sentiment from the stamp set which says "Make a wish upon a starfish." I stamped that onto some white cardstock using Simon Says Stamp clear embossing ink and then embossed it with a gold embossing powder. I used my ATG gun to adhee my sentiment strip onto some vellum and then popped up the sentiment on the card. For the finishing touches I added a bunch of details and highlights to the mermaid with my gel pen. I also added a mixture of clear and white sequins to the background using my Tombow glue. Finally I added a bunch of Wink of Stella glitter to the mermaid. 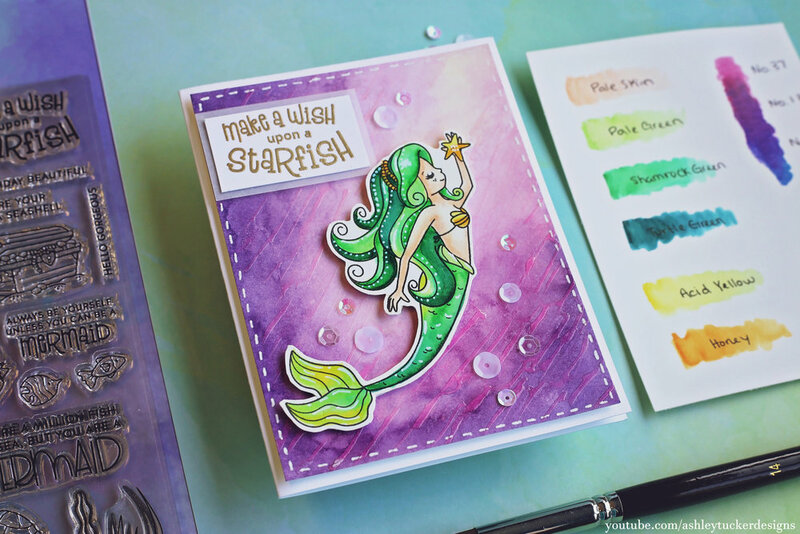 I just the Simon Says Stamp card kit for September and I am so excited because it has mermaids! I love mermaids! I stamped one of the mermaids from the Beautiful Mermaids stamp set on a piece of Bristol Smooth paper with Simon Says Stamp intense black ink. I then used a Copic Multi-liner to extend the lines of the stamp so that the ground went to the edge of the paper on either side. I colored in the mermaid with my Arteza Real Brush Pens. Once the coloring was done I fussy cut the image out with my scissors. Check out the video if you want to see all of the coloring in more detail! Next I took a piece of Canson watercolor paper and I did some Distress Oxide Ink blending with the colors Tumbled Glass and Stormy Sky. I used a seaweed stamp from the Beautiful Mermaids stamp set and stamped across the bottom of the blending with the Stormy Sky ink. I then went over the background with my powder tool to prep it for embossing. I put a stencil over the background and pressed a Simon Says Stamp Clear Embossing ink pad down onto the stencil to transfer the design. I heat embossed the design with clear embossing powder for a nice subtle detail. I adhered my blended background onto a piece of dark gray cardstock and then glued that to my card base. I then popped up my mermaid piece onto the card with foam tape. For my sentiment I chose a stamp from the same mermaid stamp set and stamped it in Simon Says Stamp intense black ink onto some white cardstock. I then adhered the sentiment to a piece of dark gray cardstock to give it a border. Then I popped it up onto my card above my mermaid image. 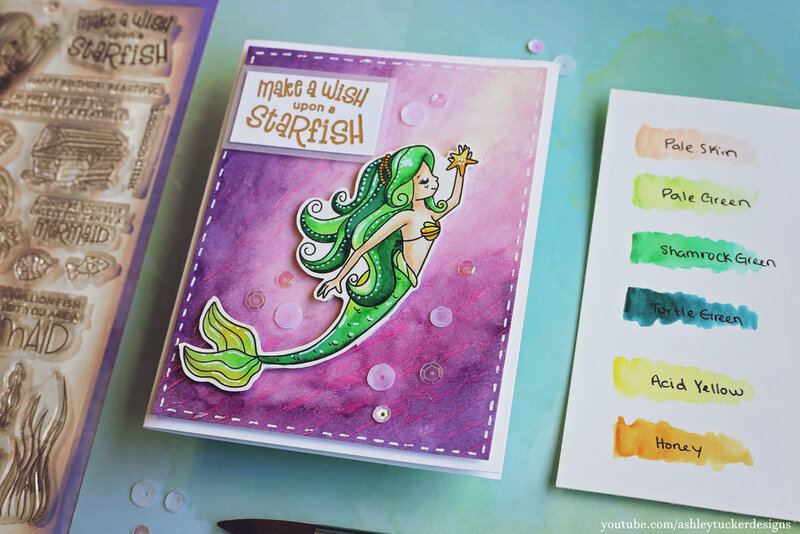 For finishing touches on this card I added Wink of Stella glitter to the sand and some to the mermaid. I also used a white gel pen to add highlights to the mermaid. I picked out a mixture of white and clear sequins and spread them across the card going from the bottom left to the top right and glued them down with Tombow glue. Finally I added drops of Glossy Accents in varying sizes following the same path as the sequins.